Let’s make some fun cards!! 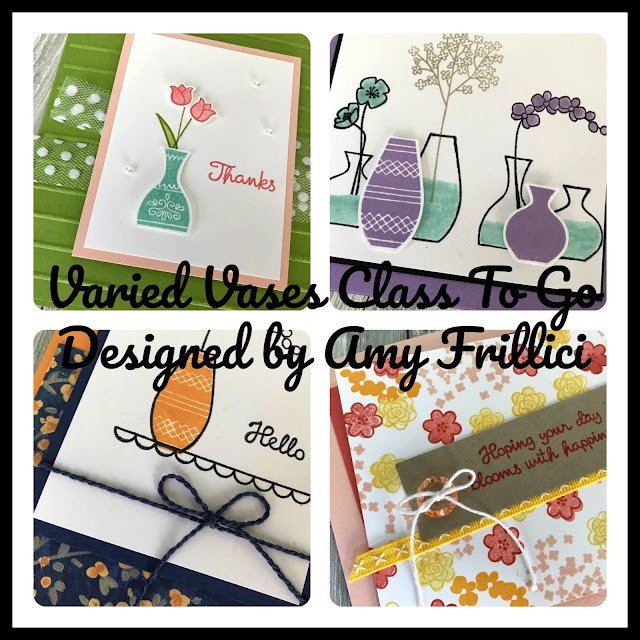 This class features the super-cute Varied Vases Stamp Set and Vases Builder Punch. You will need Coastal Cabana, Highland Heather, Sahara Sand, Mango Melody, Flirty Flamingo, Granny Apple Green, Calypso Coral, Daffodil Delight, Petal Pink and Black Stazon ink for this class to go. I recommend using Fast Fuse and/or Snail Adhesive to assemble your projects. You will also need Stampin’ Dimensionals. There are five options for this class. This is the full Class To Go Kit. It includes the Varied Vases Photopolymer Stamp Set, the Vases Builder Punch, all 5 new color Ink Pads (Coastal Cabana, Highland Heather, Mango Melody, Granny Apple Green & Petal Pink) and Make & Take materials for all eight (2 each of 4 designs) cards. And… I’m throwing in a bolt of Whisper White Polka Dot Tulle Ribbon For FREE!! You will also receive the full PDF tutorial. Email me for the registration link at amy.frillici@yahoo.com. This is a partial Class To Go Kit. It includes the Varied Vases Photopolymer Stamp Set and Vases Builder Punch only (no new color Ink Pads) and Make & Take materials for all eight (2 each of 4 designs) cards. You will also receive the full PDF tutorial. Email me for the registration link at amy.frillici@yahoo.com. This is the partial Class To Go Kit. It includes the Varied Vases Photopolymer Stamp Set (no Vases Builder Punch - we'll do your punching for you) and Make & Take materials for all eight (2 each of 4 designs) cards. You will also receive the full PDF tutorial. Email me for the registration link at amy.frillici@yahoo.com. Option #1, #2 and #3 all ship priority mail for $7. If you are local (Alma, MI) and would like to pick up your class kit, choose "Studio Pick Up" to save on shipping. PDF Tutorial only- want to cut your own cardstock and already own the products? This is the option for you. If you purchase the PDF Tutorial Only option, you will be emailed the links. If you do not receive them within 24 hours of purchase, please email me! Email me for the registration link at amy.frillici@yahoo.com. Free for my downline. Join my team and get all of my PDFs for FREE!! Inkspired Stampers Members (my downline) can purchase this option for the make and take kits and PDF tutorial. Want to join my team and get all my class kits at a significantly low price? Details about purchasing the Starter Kit can be found here. All class kits and included product will be ordered and prepared after the deadline. This is a preorder only, and per SU policy, I do not have products on hand ready to ship. Because of this, it takes about 10-12 days after the deadline for me to order, cut, prepare and ship all the class kits. Class kits can only be mailed within the United States. If you live out of the US, you can still purchase the PDF. Registration will close on June 22. Expected shipping date of all kits is July 3. Stampin' Up! 2018-20 In Colors! !